Walking Las Ramblas is a rite of passage, an essential activity of Barcelona tourists, and Las Ramblas street performers are part of the fun. 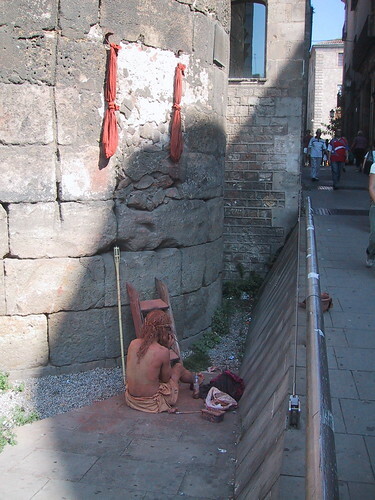 Barcelona’s famous and popular street is both convenient and entertaining. At one end is Placa de Catalunya and the other Port Vell. The Barri Gotic quarter borders Las Ramblas and on the other side, Mercat de la Boqueria is a popular market destination worth a look. Las Ramblas is situated in the middle of all this activity and provides entertainment with its street performers, vendors and restaurants. Here’s a selection of some of the Las Ramblas street performers who have performed for Barcelona, Spain tourists and local alike. Here’s a guy losing his head. 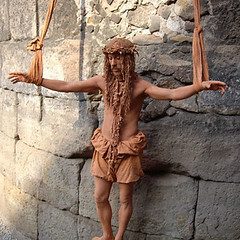 Here is a religious performer. 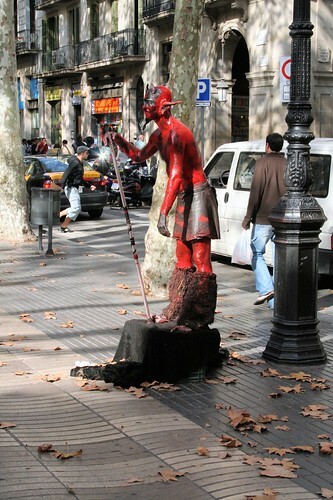 This Las Ramblas street performer is dressed as the devil and trying to make a living. 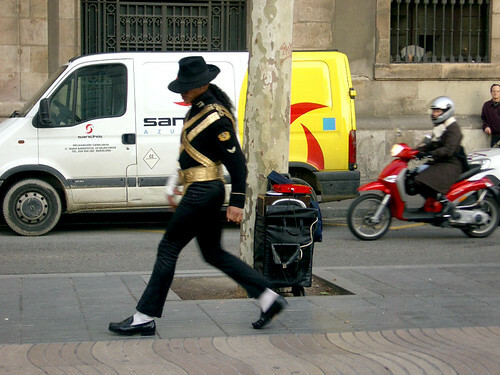 Dance performances can sometimes be spotted, whether a dance troupe or a single dancer like this Micheal Jackson look-alike street performer on Las Ramblas. Confused? 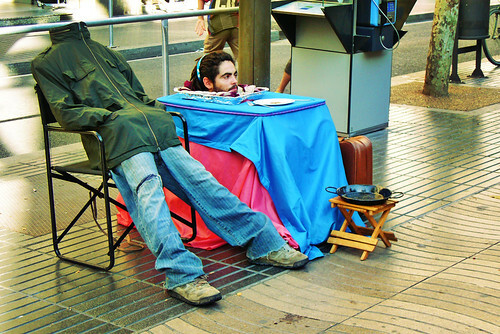 I’m not really sure what to make of this Las Ramblas performer. Most Barcelona visitors make it down Las Ramblas at least once during their stay. The street is a very convenient walkway. While being entertained on Las Ramblas, use common sense. Just like in any city in the world, when gathered around other “tourists”, be careful of your belongings. This is where pick-pockets do their best work. Of course, your IDs and credit cards will be extra protect by using a money belt. One of the hotels I stayed at in Barcelona required that the room key be kept at the reception desk. 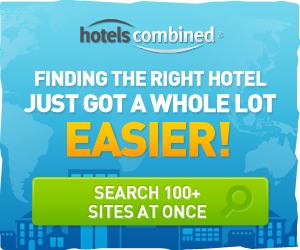 The hotel staff said that they had problems with keys being stolen so they thought it better to hold onto the keys behind the counter. Now that’s a sign to be careful of your belongings.